AC Hotel coming to Raleigh, N.C.
Thursday, January 15, 2015 – AN AC HOTEL by Marriott will be built in an upscale Raleigh, N.C., neighborhood. 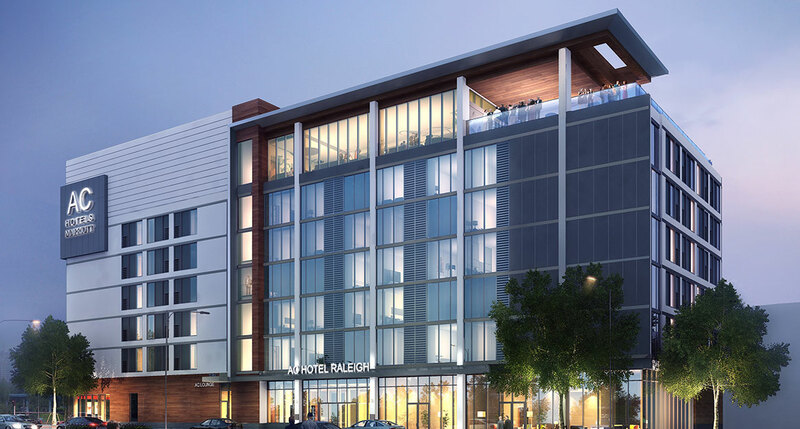 Concord Hospitality Enterprises and Kane Realty Corp. today announced that they will develop and operate North Carolina’s first AC Hotel, a lifestyle brand, in Raleigh’s North Hills section. The 133-room AC Hotel is expected to open in 2016 in the Park District at North Hills. It isConcord and Kane Realty’s third hotel joint venture in North Hills, the heart of Raleigh’s Midtown mixed-use district that includes high-end boutiques, spas, department stores, restaurants and entertainment venues, including a cinema and a bowling center. Founded in 1998, AC Hotels is an international hotel brand with nearly 100 hotels primarily in Europe. AC Hotels and Marriott International formed a joint venture in 2011 to expand the brand in the U.S.
AC Hotel Raleigh is one of more than 30 hotels set to open within the next three years throughout the U.S. and Latin America. Development of the hotel is gaining momentum since November, when Asian-American-owned NewcrestImage opened the first AC Hotel in the U.S. in New Orleans. Noble Investment Group, a private-equity concern led by Mit Shah, will build the boutique brand in Atlanta and in Kansas City. Conor Acquisitions, another Asian American owned hotel development company, plans to open an AC Hotel in Florida. Concord Hospitality’s president and CEO, Mark Laport, said although there are a Renaissance and a Hyatt House in the North Hills district, the AC Hotel “speaks to a slightly different demographic than the existing hotels,” and the neighborhood is vibrant enough to support another hotel.